After years of traveling and travel planning I’ve got a few tricks up my sleeve to save money while booking travels. From finding student discounts to travel essentials, here are a few of my favorite travel resources! Also, be flexible with the travel search engine you use. Use comparison sites like Skyscanner, Priceline, or Expedia to make sure you are getting the best possible rate when you’re booking a flight or hotel for your trip. 1.5 because this fits between tip 1 and tip 2. Okay, so I recently started using Ebates a few months ago and I wish I would have started using it sooner. I’m obsessed already. Ebates is a site that gives you cash back for shopping online at your favorite stores! So you’re basically getting paid (earning cash back) to buy things you would normally buy anyway. I booked a super cheap flight on Ebates.com with Priceline for my trip to Hawaii and a few weeks later I got a check in the mail for my cash back. I never buy anything online without checking Ebates first. Sign up for FREE here to get a $10 welcome bonus instantly and start earning cash back! In addition to everyday purchases Ebates will get you cash back on hotels, flights, and even car rentals. So you’re basically getting paid to travel right? Sign up here now to get $10 cash in your account for free. As I mentioned before, it is so important to do research before you book any part of your trip. Kiwi.com & Skyscanner.com are the BEST and my favorite ways to find out how to get ANYWHERE super cheap when traveling or making travel plans. Skyscanner.com lets you search ‘flexible’ as the destination which basically means show me everywhere that I can go from my home airport. It also lets you search by cheapest month. Want to know what month and day it’s cheapest to go to Thailand? With the click of a button skyscanner will show you. Kiwi.com works in a similar way by letting you search cheapest month and flexible dates, but another good thing about Kiwi.com is that they also give you the option to do a radius search, which means they will include all nearby airports within a certain radius because it may be cheaper to fly from one of the nearby airports rather than your home airport. When using the desktop version of Kiwi.com you are also able to see recommendations of cheap trips from your selected airport. Many people get so excited about their upcoming trips and they end up booking the first thing they see and end up paying more than they should. Don’t be that person. Always see if the hotel or airline offers discounts for your trip (Student discounts, Military, Flight Attendant, Government Employees, Honor Societies & Automobile Club discounts to name a few). If you don’t see a discount listed on the website of the hotel of your choice, call and ask if they are currently running any deals. Bonus tip: Hotels often price rooms above the price they are actually willing to accept, for example if a hotel has a room listed for $150 call them and ask them if they are able to go any lower than that. I’ve seen this done and it works. Sites like Living Social also offer excellent deals and discounts on activities, excursions, dining, cruises & they even have an entire section dedicated to cheap getaways. I recently saw a deal for an 8 day trip to Paris and London with flight included for only $799. Always be sure to do research before booking. Discount airlines such as Frontier Airlines and Spirit Airlines are becoming very popular for their low prices, but a lot of travelers don’t get the deals they should be getting when flying with these budget airlines. I often hear complaints that “Spirit/Frontier charge for bags” that is NOT true. I have been happily traveling with both airlines for a few years and have never paid any baggage fees. ( I prefer to travel with this bag because its big enough to fit everything I need for my trip, but small enough to fit under the seat in front of me = aka its free to travel with). These airlines charge for carry on items and checked bags, BUT you are allowed to bring on a FREE personal item that is 18 x 14 x 8 that must go underneath the seat in front of you. & truthfully, 18 x 14 x 8 is not much smaller than the carry on size of 22 x 18 x 10 that you WILL pay $35-$100 for. So, opt for the free personal item. This means travel like a local, eat like a local, stay like a local, and get around like a local. One way to do this is to stay in an Airbnb. Not only will this give you a more authentic visit, it will also help you avoid those expensive tourist prices. 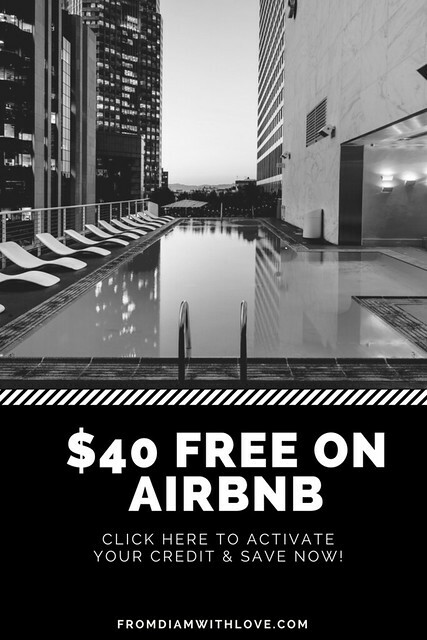 Save $40 off your next Airbnb stay by signing up here!! Most of us are used to driving everywhere, so when traveling some automatically want to get a rental car. Unless you absolutely have to rent a car, SKIP THE RENTAL. Take local transportation such as buses, especially in other countries because it is very cheap and sometimes as low as 1$, which definitely beats spending a couple hundred on a rental car. I visited Paris in March, and saved so much money by staying in a beautiful Airbnb apartment & taking the train and bus while there. This also was considered off season for Paris which is how I scored a flight that was $900 cheaper than it usually is. I still can’t believe I saved $900 on a flight to Paris. Many credit card companies partner with hotels and airlines and offer a generous amount of points per dollar spent which means free hotel stays and free flights! Some even offer bonus points just for signing up! Check out my travel resources page for all your travel needs! This post contains affiliate links. By clicking these links I may receive a small commission at no additional charge to you. Awesome tips !! Especially the credit card one.. I hadn’t thought much about that! Thanks! Yeah, there are a lot of big name credit cards that pair with hotels like Sheraton, W Hotels, Hilton etc. They’re great programs! Thanks again for reading! Thanks for the super useful tips! Totally agree with staying at an Airbnb. You can’t go wrong! thanks Terrine! Glad you enjoyed it! Awesome tips ! Just waiting to get my travel credit cards so that can follow the 5th tip too. Thanks, Carinda! Glad to help! I am blown away by this post. Great information. I can’t wait to use some of your tips and travel smarter. Thanks! That was an amazing post. I love traveling. But, traveling is not always budget friendly. I will try these tips from the next time. Thanks Diam! Your tips are always great… now I just need to go travelling! It’s been a year I have started travelling, and these tips will be useful in my future endeavors. Nice work. These are great tips! I did not know about Skyscanner or Kiwi. I also did not know about the free “personal” bag on Spirit. Thanks! Great tips! Always good to have tings like this in mind when you travel. Loving the tips especially doing it like a local. Not only cheaper but in terms of food it’s usually much better than what you’ll get in the more touristy places! Liked your tips! Traveling in budget is one thing everyone is looking out for! So nice topic! Do what the locals do is the best advice I think. A super blog and tips that were new to my ears. I am glad I found you on social Saturday and am sure we will speak again. Great article. I think the best thing you can do no matter where you go is to “do how the locals do”. Only then you live the experience to the fullest. I’ve never checked out a few of these sites- kiwi.com for instance sounds like something I should already know about! I also think you make a great point about personal items and travel. I don’t love the discount airlines because it feels like the fast food of flying. But then again, if the point is getting somewhere and not about maximizing comfort en route then these truly are excellent options. Thanks for the pointers! Love kiwi.com and the suggestions to just ask for a lower rate! My dad does this all the time and I’m surprised how often it can work. I also advocate for hostels in addition to Airbnb. Great travel tips! I’ve found that flying out on a Tuesday is the cheapest. Also booking directly with a hotel is sometimes cheaper than Booking.com etc. The hotels can also match the price on booking.com too. I’ve not heard of Kiwi.com – might have to try that one! Thanks for the great tips! I’ll definitely be using them when I plan our vacations! Thanks for some really useful tips. I agree that you should behave like a local. It is something that I always try to do when I travel and so far I have not been disappointed. I agree with you about the cold weather! I went to Paris in March and this Florida girl was FREEZING! Thank you so much for the tips. I guess the one’s which I already follow are the Skyscanner and travel like a local. That is also the reason I aggregate Bed and Breakfast rooms in India so that travelers like me who like to experience local culture can do so in India as well by staying in an Indian home with an Indian family! Thanks for the tip of using credit card with reward schemes. I am wary of using credit card lest i forget to pay their bills but yes now i consider them! Loved this! Great tips and nice formatting- very cute! Really good practical tips! Thank you. I think I’m the cheapest person alive. When I see lists of platforms that search for best valued plane tickets I expect them to be almost free or something like that, haha. Great tips! We are always on a budget when we travel. I love affordable travel because I feel like it really takes some of the stress away from traveling. I didn’t know that you could call the hotel and ask if they’re willing to offer lower prices! That’s seriously awesome. Thank you for the awesome tip. It is always economical to plan ahead before going on a trip. Aside from traveling on weekdays can save you a lot, there are also less tourist on weekdays so you have all the touristy spot by your self. Nice bunch of well-rounded tips. I’m a big fan of travelling on weekdays to get a better deal. I Really have to up my game in terms of credit cards. Im currently on a hunt for a good one with great rewards. Thanks for the tips! Such an amazing list of practical tips. extremely helpful for anyone going backpacking on a shoestring budget. Thanks for the great tips! Traveling on the weekday defo helps! Love this article especially ‘do as the locals do’ it really gives you that real experience! I totally agree with staying like a local. It saves you money when you just observe where locals eat or buy stuff. Just signed up for ebates. Thank you! You’re welcome! It is always the first place I check before buying anything online. You’re gonna love it! Oh wow no I’ve never heard of that! I’m gonna look it up now actually! Thanks!